EAST LANSING, Mich. -- Prior to kickoff of the Battle for the Paul Bunyan Trophy, the University of Michigan football team unveiled a legacy uniform designed by apparel provider adidas. 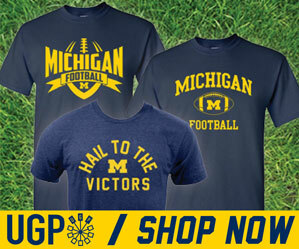 The legacy jersey is a compilation of design elements from different eras of Michigan football. 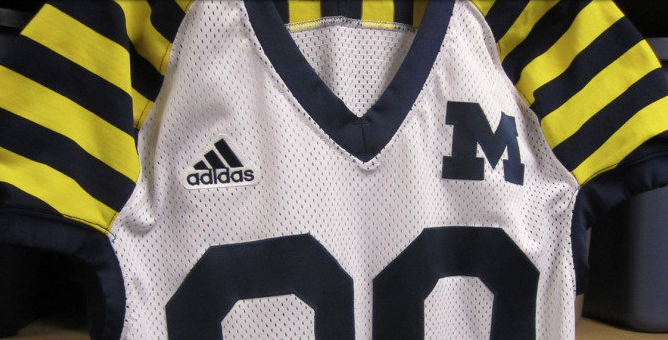 It features player numbers on the front and back of the jersey with a block M above the heart and repeating striped sleeves. The shirts under the uniform have “Victors” on the left bicep and “Valiant” on the right bicep. The white pants are a throwback to the 1974 and 1975 seasons when the program wore all white on the road. In addition, the Wolverines wore two-tone socks with blue on top (calf) and white on the bottom. Player numbers continued to appear on the famous winged helmet that first appeared in the late 1960s. After wearing them on the helmets for the Notre Dame game, head coach Brady Hoke decided to continue the tradition before the start of the conference season to pay homage to the former players that represented the program in the past. Michigan warmed up in its traditional road uniforms but returned for the start of the game in the new legacy uniforms.